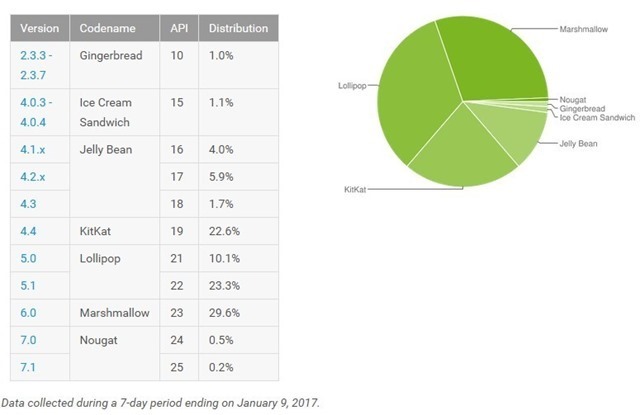 The first Android Distribution Numbers for 2017, has been released by Google. The bad news first, Froyo, aka Android 2.2 from 2010, has fallen past the minimum threshold of 0.1%, and is no longer in the charts. Now, the good news is not exactly, well good news. Android 5.0 and 5.1 Lollipop, refuses to let go of its number 1 position, and sticks to it with 33.4%, after losing just 0.6%, from the numbers it held a month ago. Android's fragmentation woes continue with Android 6.0 Marshmallow, which only gained 3.3% from 26.3% to 29.6%, while Nougat 7.0 saw the least increase possible, from 0.3% to 0.4%. It might take a couple of years, before Android Nougat might be able to take the crown. The main problem is that new devices still ship with Android Marshmallow, which really is not helping Google’s idea of faster updates. Meanwhile, KitKat 4.4 dropped to 22.6%, a drop of 1.4% from its previous numbers, while Jelly Bean has 11.6% compared to the 12.8% shares, from December. A legacy version of Android, Ice Cream Sandwich, saw its usage share drop by 0.1%, while its predecessor, Gingerbread, saw it drop by 0.2%, with 1.1% and 1.0% respectively.